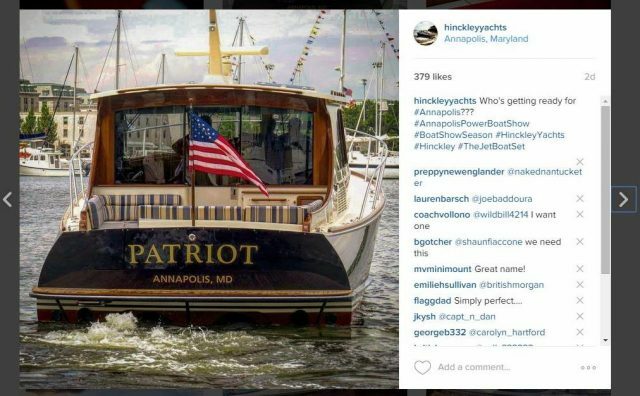 If you have Instagram and aren’t following @hinckleyachts, do it right now! Not only do we have pictures and videos of beautiful yachts in picturesque settings, we also share information on events and announcements about new model releases—sometimes even ahead of official notices. Here are the top 4 reasons to start following @hinckleyyachts today! 1. We’re what day dreams are made of. Who among us isn’t already nostalgic for summer? As we settle into fall, you can look back at the amazing season we’ve just had, all in the palm of your hand. You can also start getting excited for Florida boating season by browsing through images of gorgeous jetboats floating through mangroves. Scroll through @hinckleyyachts during your lunch break, while waiting at the DMV—basically whenever you need a pick-me-up—and day dream away! Were you just dying to go to #HinckleyInTheHamptons but couldn’t make it to Sag Harbor for our two different events there this summer? How many times have you wanted to attend the Annual Owners Rendezvous on Nantucket but had a wedding instead? You no longer have to suffer from a “Fear Of Missing Out!” By following us on Instagram you can live vicariously through our Instagram feed to see the best shots from each function. It will also motivate you to attend the next shindig, effectively ending your FOMO for good. If you own a Hinckley, or if you’re simply a fan of American-made icons, you know with one look at the #MaineInspired lines that you #CantBeatThatTeak! This brings me to the third reasons to follow us—we’ve broken down our feed into easily-searchable, fun hashtags! If you follow @hinckleyyachts on Instagram, you might have noticed a couple of trends, such as #RunaboutWednesday, where we pay homage to our sleek and sporty #HinckleyRunabouts. Or you might have appreciated the fast-paced thrill of #FlushDeckFriday, with pictures from our new #Bermuda50 as she turns heads on the race courses all over New England. You might have thought to yourself that this is #aNewClassic, built to #HinckleyStandards, in short: #ChangingTimesFasterLines. 4. We love catching up with our owners and friends! We want to see pictures of you in your #HinckleyHappyPlace! Tag us, direct message us, use our hashtags—whatever works for you and we’ll be sure to send the love right back. So if you’re a part of #TheJetBoatSet, thinking #IHeartHinckley, follow us on Instagram today!